The minute I saw this cake set, I realised how simple making the Hello Kitty cake could be. From Edna's party last year, I realised that cutting the cake was usually a messy event. Making cupcakes would be far easier, but the effect isn't as nice as a large whole cake. 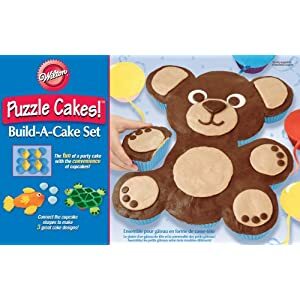 Therefore, the puzzle cake set was a perfect in-between - I had a big cake, and it's made up of cupcakes! After frosting over, I sketched out the pattern of how I'd be frosting the cake. Essential items of Hello Kitty would be the ribbon on her left ear. Also, the cake shape for the ear is curved, but I shaped it into a point. I figured that I'd deal with it when I outlined the cake later. After frosting the cake, I used 2 chocolate Malteses for Kitty's eyes and yellow Nerd sweets for Kitty's nose. The cake was beginning to look like Kitty. I outlined Kitty with the chocolate coating I used for Edna's cakepops. It was an inspired move because the chocolate hardened and helped hold the frosting together. I melted the choc in a HD plastic bag, cut a tiny hole at a corner and used it to pipe the outline. As there was already an impression in the frosting, the piping held neatly. I topped off Kitty's whiskers with Pocky sticks. I used the melted choc to pipe the whiskers and eyes. A Nerd sweet made up the nose. Two Jumbo hearts and a red M&M made the ribbon. Beat cream cheese and butter together. Gradually add icing sugar until frosting stiffens. Add flavouring of choice. For this cake, I used a Strawberry essence, which went well with the chocolate cake. Your kids might find this interesting.